Third Thursday Thoughts, December 2016. The third Thursday of each month, I do a brain dump and write what is in my mind at the moment. Hard to believe this month is already half-way through and there are only two weeks left in 2016 till we welcome a brand new year. I still have plenty of Holiday Outfits and Dresses to show you this month. I still have some Wish Lists and some window shopping, for your pleasure and mine, but today I can't help but focus at what is around us. The latest news in Aleppo has affected me and I had to react to it, like any human being can. Seeing all those photos of children bleeding, with limps missing, hundreds dead, is disturbing and very sad to say the least. How do I protect my own child?! Why is there so much hate and senseless crimes happening every day? Earlier tonight I shared a post on my Facebook in regards to this and I am re-posting it here on my blog. I am sorry if this is a little bit too deep and too sad and not normally what I post here but the world around me is a sad, bad place and I couldn't help what my heart felt. Read away, below. It is a twisted, sick, evil world we live in. A world that makes you doubt humanity and anything humane. A world where people stab you in the front, in the back and sideways, both literally and figuratively. A world where the most sacred thing which would be the human being is sacrificed, raped, stabbed, murdered, assaulted or bombed at any given minute. It is a world where there is no unity and no peace, where brother kills brother and fathers/mothers murder their children instead of protecting them. Every day there are dozens of bad news, some close to home, in your neighborhood, at your place of work, in your town and some thousands of miles away in places you never dream of ever being nearby like Syria, Afghanistan or North Korea. There is no escaping the bad of this world no matter where you are. It is this cold world that makes you doubt your power as an individual. As a parent you want to protect your child/ren. As a parent, you get discouraged of bringing other children into this evil world. The overbearing customer at work or the rude cashier at the checkout becomes the least of your problems. The holiday glow and all the lights and decorations around you can't disguise the hurt, pain, malice, terrorism and senseless acts of inhumanity that happen each day. You are weak in front of the world. You can't even protect yourself. Your vote, your voice, you kindness and your good heart are worth nothing. A decade and a half ago it was New York, then Iraq, then France, then Belgium, then Miami, now Aleppo and that is just scratching the surface. When will it end? When will the world be a safe place? When will the killings, the bombing, the discrimination, the hate and all the crimes stop? When?! The world is not a safe place, very far from it. It has probably never been as cold, as desperate, as cunning and as cruel and as unsafe as it is today. Christmas is around the corner and we will soon welcome a new year and knock our glasses to say cheers when the clock hits midnight on December 31st. We should be happy and joyful. But how can we? While most of us count our blessings and are grateful for our health and our children and our family members, we can't help but feel sad and sorry for those unlucky ones that are affected daily because of politics and religion, because of money and power. While 2016 was mostly a great year for most of us as individuals it was a sad, bad and black year for the world in general. History was made and most of the time it wasn't good. But it has to stop. At some point in time, the countries need to get along and the innocent lives need to be protected. So sad and sickening what is happening in #Aleppo. As a woman, as a mom, as a human being I am so touched and livid. Tonight I have one more reason to hold and hug my daughter tightly, as she sleeps peacefully without a care in the world. Lucky for her she is too young to know or understand. I pray to God to look out and protect her every day she lives because sometimes I can't. 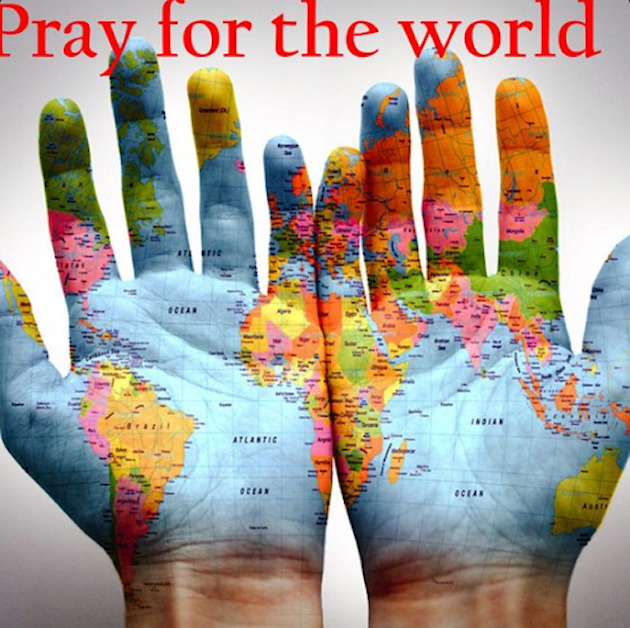 Today I pray for humanity not just for Syria. Today I pray for the world so that when our kids are adults they get to see less hate and more love! Let's take a moment to pray, to pray for every victim, for every hurt child, to pray for humanity and to pray for Syria and the world. Let's take a day off and not focus on clothes, style and everything else we have and take for granted (most times). God stop the insane! God stop the hate! God guide us towards the light and bring us love and peace!